Climate change: Get ready or get sued. We’d like to share with you some updates about how a gas lease may be affecting homeowners insurance and loan and mortgage requests. Fleased has recently learned that individuals in Madison County, NY could not get homeowner’s insurance due to the presence of a traditional vertical gas well on their property. As insurance companies learn more about the effects of gas drilling, multiple underwriters are not covering homes or properties with wells or gas leases A large insurance company we spoke with that covers an area from the Southern Tier north to Watertown said they have NO insurance underwriter who will write a homeowner’s policy for any property that has an existing well or even a gas lease. Mortgage lenders require homeowner’s insurance so the inability to obtain such insurance would make it impossible to get a loan. It would be wise not to let your current homeowner’s insurance lapse, but to renew if possible and be sure to check the fine print on your homeowners insurance if you’ve got a gas lease. Insurance is not the only issue lessors are noticing. Banks are beginning to question landowners about fracked wells and impoundment lakes on (and even near) properties when owners seek to obtain a mortgage or home equity loan. A property owner in Pennsylvania was recently denied a mortgage. In an email, Quicken Loans told the property owners, “Unfortunately, we are unable to move forward with this loan. It is located across the street from a gas drilling site.” Two other national lenders also declined to make the loan. As more is learned about high volume hydraulic fracturing, banks and federal agencies are revisiting their lending policies to protect themselves and account for potential impacts on property values. Sovereign Bank, a major national lender, has added a rider to their mortgages that states that “the mortgage will be automatically recalled if the property owner transfers any oil or gas rights or allows any surface drilling activity.” It also says owners must “take affirmative steps to prevent the renewal or expansion” of any current lease. Insurers: Fracking-related damages not covered by standard policies – Timesonline.com: Progress Edition. Fracking: Considerations for risk management and financing – Milliman Insight. 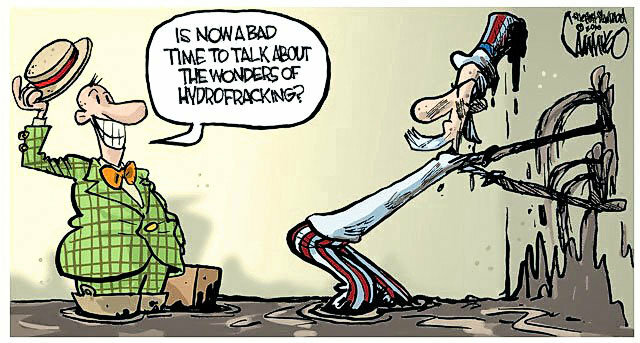 Fracking Lawsuits Pile Up In Pennsylvania – Bryn Mawr-Gladwyne, PA Patch. 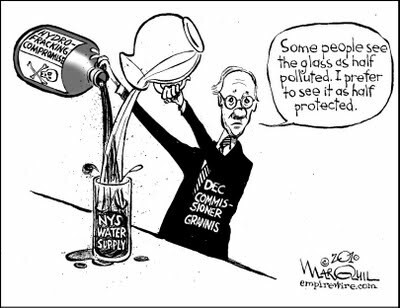 Nationwide’s Fracking Policy Puts NY Farm Bureau in Awkward Spot | Politics on the Hudson. 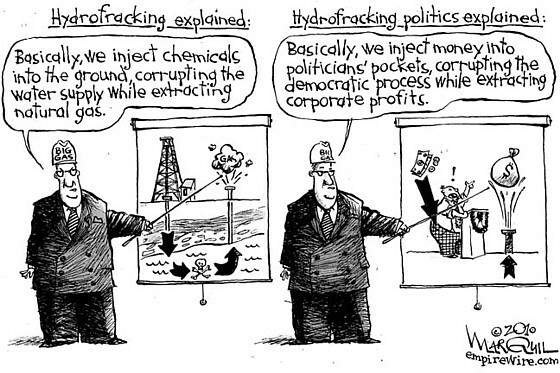 The implications of this are HUGE and there can be little doubt that the gas industry is preparing a robust response (based on more deception and mis-information) concerning the “true” risks associated with fracking. This is an opportunity to turn up the heat and change the debate to include concerns arising from insurers, who are not likely to be “radical environmentalists”. If too risky for nationwide (who is on YOUR side), then what about YOUR community??????? Nationwide Mutual Insurance Co. has become the first major insurance company to say it won’t cover damage related to a gas drilling process that blasts chemical-laden water deep into the ground. The Columbus, Ohio-based company’s personal and commercial policies “were not designed to cover” risk from the drilling process, called hydraulic fracturing, or fracking, Nationwide spokeswoman Nancy Smeltzer said Thursday. The Kingston Daily Freeman is your source for all Hudson Valley 24-hour breaking news, local news, sports, entertainment and more. View daily weather updates, watch videos and photos. Keep up with Kingston’s News and Kingston local Sports.